PDF Postman™ Email Encryption Add-In for Microsoft Outlook: Configuring the Password Database with PDF Postman, The Outlook Email Encryption Add-on. Configuring the Password Database with PDF Postman, The Outlook Email Encryption Add-on. The PDF Postman email encryption add-on for Microsoft Outlook is a useful tool for sharing information securely using email as a context. With PDF Postman, you can compose an Outlook email message and attach files, and then send them securely to the recipient. The message is converted to an encrypted PDF file, which can be opened by the recipient if they know the password. This article is intended for current users of PDF Postman. If you are not currently using PDF Postman and would like to try it free, please download the free 15 day trial and follow along. PDF Postman uses symmetric key AES-256 bit encryption. This means that sender and receiver agree on a password; the same password is used to send the message as is used to open it. Asymmetric encryption schemes, such as OpenPGP will require the exchange of a public key, with your private key kept confidential and in your possession. While OpenPGP is an excellent and secure system, it can be very difficult to setup especially for non-technical users, and it does not easily lend itself to cross platform use. With PDF Postman, we have tried to design a system at the point of email transmission and reception that uses a strong and proven encryption standard that does not burden the recipient with special software downloads across their multiple device platforms, such as phones, tablets, and PC's. By using the PDF format, opening a PDF Postman message is a simple process for the recipient, since they are very likely to already have a PDF viewer on the device that is capable of opening an encrypted PDF file. When you send an encrypted message from Outlook, PDF Postman, checks it's password database. You can have a local database or a remote database (more on that in a moment). 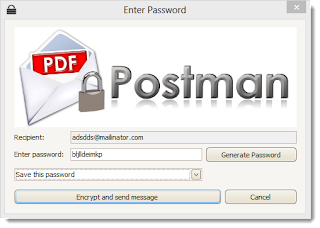 If a password is found for the email address you are sending to, PDF Postman will encrypt the PDF file using that password. This saves you, the sender, time. If a password is not found for the recipient, then PDF Postman will prompt you to enter one. 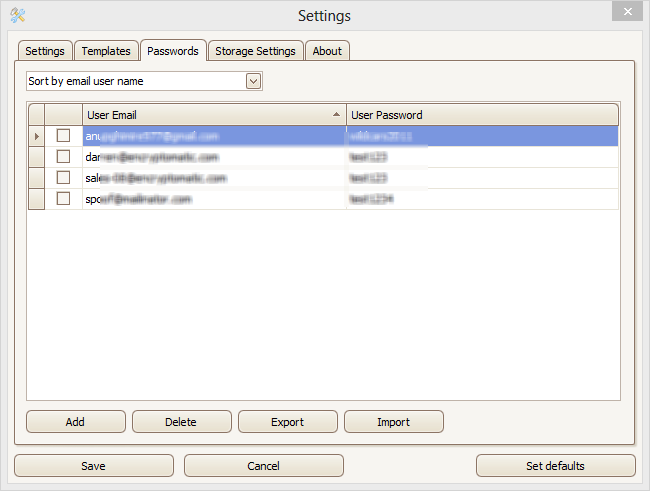 At that time you can also select whether or not you want to store the password in PDF Postman's database for future use. Click "Generate Password to create a strong password, or invent your own. Passwords may be changed at any time by going to PDF Postman's "Password" tab (Settings>Passwords). This page allows you to change any of the email addresses or passwords. Just click or touch the information you want to update, then choose "Save" when you are done. If a businesses has many MS Outlook users running the PDF Postman add-in, each communicating with different customers, and each inventing a different password, customers would soon become confused. In addition, a security problem would emerge with many employees having access to many customer's password. PDF Postman can be configured to store passwords locally, remotely, or maintain passwords both locally and remotely. This helps prevent multiple passwords being assigned to individual customers. When an employee is sending a encrypted document to a customer who already has a password assigned in the remote database, PDF Postman will find the password in the remote database and apply it to the PDF file, without revealing the password to the employee. 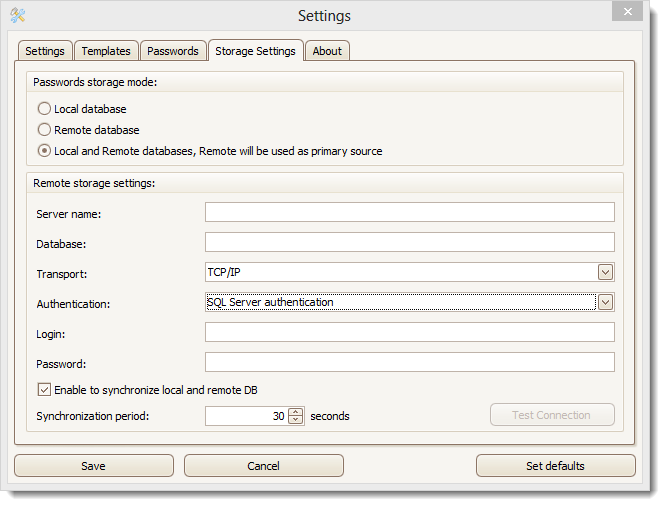 Password databases are configured at Settings>Storage Settings. PDF Postman supports both SQL Server authentication or Microsoft Windows authentication. A variety of transport protocols are supported beyond TCP/IP. For more information about setting up the PDF Postman remote password database, please see the below document that has been prepared by the support group. PDF Postman Outlook email encryption password database setup.